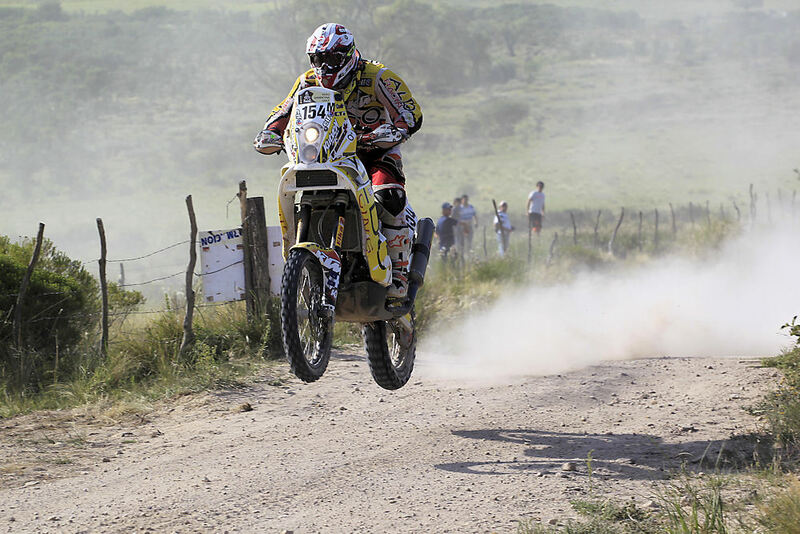 When it comes to off-road racing, there is no event bigger than the Dakar rally. Sure, the Baja events have grown in popularity in recent years, but no race has drawn global attention to itself like Dakar has. Which is why, in 2013, Patrick Beaule found himself on the starting line in Lima, Peru. Beaule took his KTM to a 62nd-place finish this year; he was the only Canadian rider to complete the event, and the first Canadian to finish the race on both two wheels and four wheels. We had a chance to sit down and talk with him recently, and here’s what he had to say about the race. Before he even got to that starting line, Beaule had to spend weeks in preparation. The registration date for Dakar is May 15, and as Beaule put it “You don’t make a decision on May 14.” The entry fee is $16,000; not only do riders have to find that money, but they also need to be sure they’re working on their bike, their physical fitness and their riding skills long before entering. This isn’t an event for your chubby dual sport rider who puts in the odd weekend running gravel roads on his KLR. In Beaule’s case, he’d been dreaming of entering the rally on a bike for 15 years; he’d run the race as a navigator in the car class in 2012. He said he made the decision to ride a bike in 2013 as he crossed the finish line on four wheels the previous year. With help from a few friends (Bryan Flanagan was a major help, along with Beaule’s girlfriend), he started to ready himself for the challenge. Beaule figures everyone’s efforts added up to about 1,000 hours of preparation for Dakar. That’s a lot of evenings and weekends. Of course, one of the biggest hurdles was simply paying for everything. All in all, the race cost Beaule $140,000; so far, he’s raised about $109,500 of that, through various fundraisers and sponsorships. He’s still working on saving the rest of that dough, but he figures that being $30,000 out of pocket isn’t so bad a trade, in exchange for living the biggest dream he’s had in his life. Along with the money, Beaule had to raise his own fitness level to handle the race. 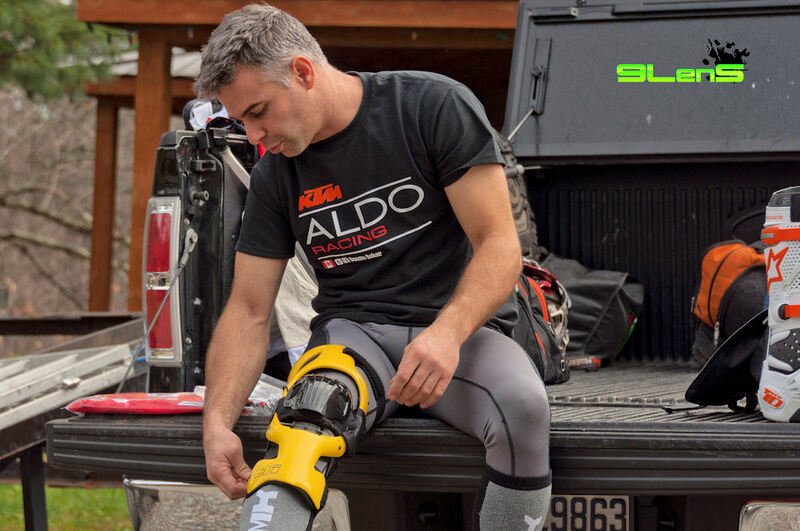 He did that a couple ways; he raced enduros, which also helped keep his riding skills sharp, and he also did some intense cross-training with athletes from other sports, including work on his cardio and muscles. He says he actually felt over-prepared physically when he got to Dakar. 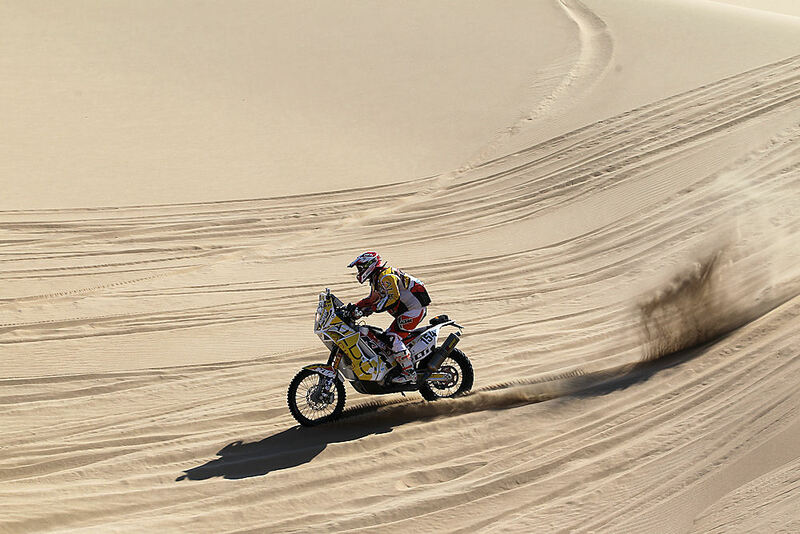 The dunes were Beaule’s favourite part of the Dakar rally. 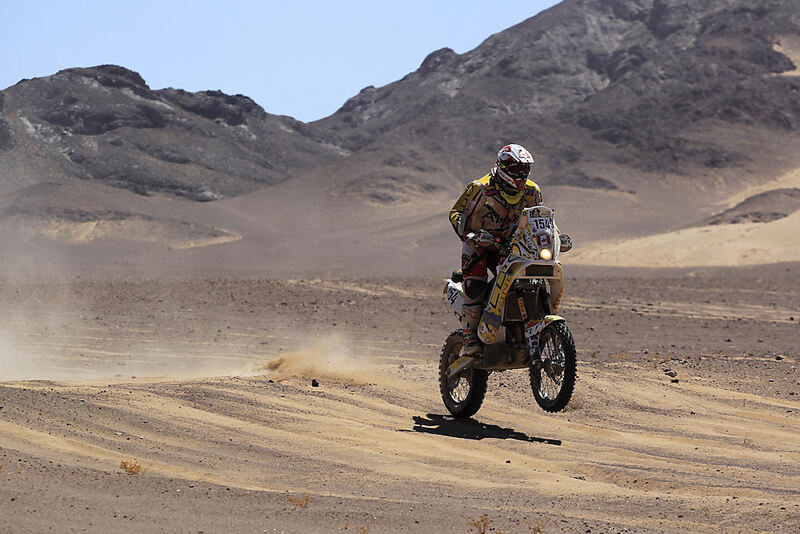 But while he’d spent plenty of time behind handlebars prepping for the Dakar, the riding was very challenging for Beaule. There was little time to enjoy the scenery – a luxury he’d enjoyed while riding in the car last year. He had to constantly focus on the trail ahead; one of the biggest causes for crashing was rider inattention, he says. He’d figured on a better place in the standings, but soon realized there was a difference between most of the Dakar racers and handful of riders on top. “What I felt was slowing me down was my level of skill,” Beaule says. “I am super disappointed in the result on paper. He’s still very happy to finish without injury, though – that was his Number 1 goal. If he returned on two wheels (unlikely – he’ll probably return as a car navigator, though), Beaule thinks he couldn’t likely finish higher than 50th. The competition is very tough. Of course, riding on the bike was a much different experience than working in the car last year. Beaule’s favourite sections of the course were the desert stretches. He said the freedom of taking a bike through the dunes, instead of a car, was tremendous. But his real high point at the Dakar race was proposing to his girlfriend at the podium, when he finished the final stage. He hadn’t planned on proposing that way when he left for South America; he’d started working the idea over in his head en route. He was happy she said yes. Beaule wasn’t 100 per cent sure what the answer would be. 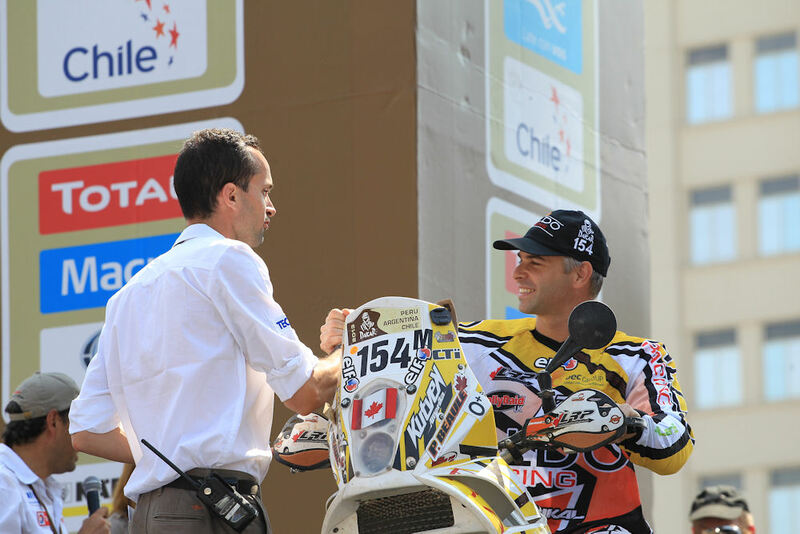 Another high point of the Dakar rally was the camaraderie between riders. On the trail, riders were mostly happy to help each other out, especially because so many of them were chasing the same dream. Off the trail, everybody was so friendly that Beaule ended up with invitations to visit riders at their homes all over the world. “Everybody is there for the same reason,” says Beaule. At one point, he helped Cyril Despres, KTM’s top rider and the 2013 winner, do an engine swap. At another point, an Italian rider saved Beaule from having to drop out of Dakar due to engine trouble, giving him some much-needed assistance. Another rider had done the same for the Italian the year before, and he wanted to pass that help along. 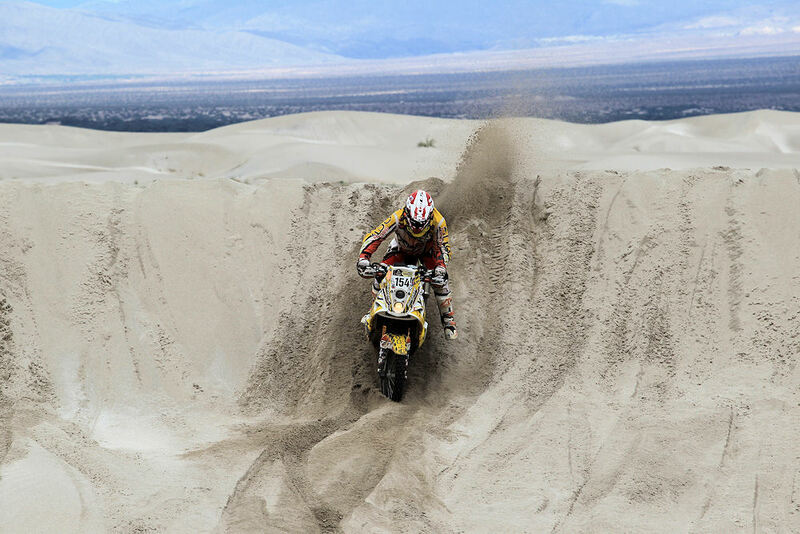 While Beaule isn’t planning to return to Dakar on two wheels, he wants to help other people achieve the dream. If a rider wants to know the big details (how to get the money required, what bikes to look at racing, how to prepare mentally and physically) or the small details (what brake pedals or clutch levers to pick), Beaule has already asked that question. He’s willing to share the answers with others who want to run the world’s biggest off-road race. If that sounds like you, get in touch with him via his Facebook page. 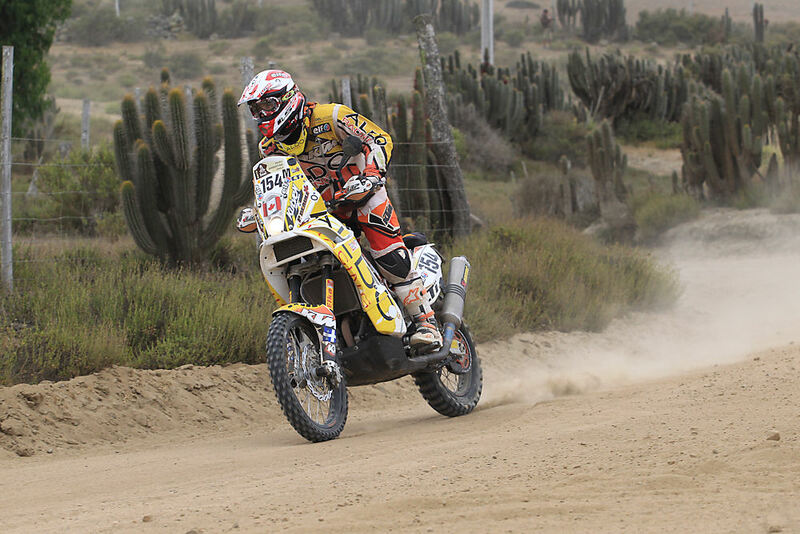 Maybe 2014 or 2015 could be your year at Dakar. 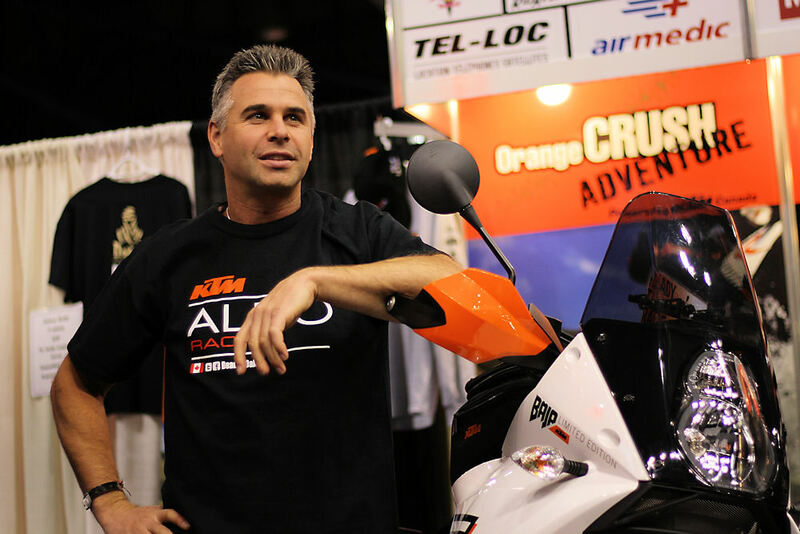 Patrick would like to thank his sponsors – Aldo Racing, KTM Canada, CTI, Elka Suspension, Kutvek, Lachapelle Racing Products, LS2, Overseas Express Consolidators, FlannyMedia.com – for helping his dream come true in 2013. Previous PostTricia Helfer: Actress, model, motorcycle riderNext PostKTM re-thinking the Freeride E?